Hawaii: The Hawaii Department of Health’s Proper Disposal of Hazardous Waste. 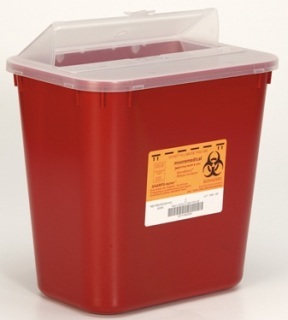 Place needles, syringes, lancets and other contaminated sharps in a strong, leak proof plastic container. The container should have a small opening so that no one is able to stick their hand into it. The container must also be clearly marked, “BIOHAZARD.” Used needles and other contaminated sharps are NOT recyclable. Keep the sharps container separate from other materials that you set aside for recycling. You do not have to recap, purposely bend, break or otherwise manipulate needles before inserting them into the disposal container. Drop all parts into the container. Sharps should be sterilized or be chemically disinfected prior to disposal. Once your container is full, fill the container with one part bleach solution and ten parts water. Allow solutions to soak for 20 minutes. Then, pour the solution into the sink and seal the cap with tape before placing the disposal container into the garbage. Use heavy-duty tape. BE sure to keep all containers with discarded sharps out of the reach of children and pets. Place any soiled bandages, disposable sheets and medical gloves separately in securely fastened plastic bags before placing them along with your other trash.